Often, when I’m talking about completing a doctoral project I say, ‘It’s a PhD, not a Nobel Prize‘ (quoting from Mullins and Kiley’s excellent go read it now article). ‘It’s not your magnum opus,’ I say, ‘that comes in about 10 years time’. Today, I’m going to talk about your magnum opus. That ground breaking, major book that takes you a decade to write. I’m going to talk about my marriage because the book and the marriage got messily entwined. And specifically, I’m going to talk about the end of the book. Andreas Loewe and I have been working on this book together since about 2003, soon after the publication of the no-so-sexily-titled Richard Smyth and the Language of Orthodoxy: Re-imagining Tudor Catholic Polemicism, Andreas’ doctoral thesis. At the time we were going out, involved in various operatic and performance projects, and deciding what the hell we were going to do with our lives. Andreas had a life-long obsession with Bach, and particularly the St John Passion; I had been trying to work out what to do with music and poetry when you put them together for about 7 years. He was a trained theologian and church historian. I was a trained literary critic and working as a professional librettist. He was putting on performances of Bach’s works, bringing kulchur to Slough. I was about to go back to university to get an interdisciplinary masters in music and literature; and I had actually found a course that did that, at Oxford Brookes (but which no longer exists). Over the next ten years, lots of stuff happened. We got married. I got a fully AHRC-funded doctoral place for a PhD (another scheme that no longer exists) that involved developing a methodology for marrying cultural history, literary analysis and close musical analysis. Andreas got his second job, became a Senior Member of the Cambridge Divinity Faculty, and wrote articles about church architecture. I graduated, we moved to Australia. He had a more than full time job, but now with study leave. I worked as a ‘casual’ academic (60 hours a week in semester time and still poor? that was me) and was having a mixed time getting stuff published (people only want to talk about my stuff now, five years later. Advice: don’t be too original). The book was never my book, but it was never not my book either. Being married to the person you are academically collaborating with can be pretty dreadful, especially if you are closely emotionally entwined too. The book comes to bed with you. It ambushes you in the shower. It takes up much of your holiday to Oxford. This year is our 10 year anniversary, it’s 11 years of the book, and the book just went to the publisher for the final time on Saturday. OH THE WOE. 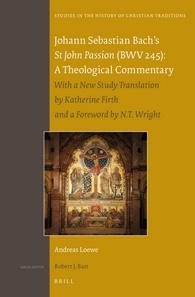 One of the things that’s different about your magnum opus (all 352 pages of ‘first comprehensive study in English’, ‘most scholarly translation’, break-the-bank-expensive academic-hardback of it), is that it’s not so intense. The final months of the book, were nothing like that. I started semester and completed some web projects. I tidied up the last threads of some older projects (some readers’ reports, some author bios, some editorial adjustments). Andreas read the proofs between writing addresses, report to his boards, and grant applications. He took no extra time off. I took no extra time off. We both left the house every morning, smartly dressed, and went to the office. But the final months of the book were stealthily stressful, in ways I’m only just starting to understand. Since New Year, I’ve found it almost impossible to cook. Now cooking is something I do, almost part of who I am. It’s the foundation of my presentation of self, outside of professional stuff. When I lived in college at Cambridge, I had my non-refundable Kitchen Fixed Charge returned to me because I cooked for myself absolutely every single day. And yet, for the last 3 months, I haven’t been able to cook. Couldn’t bear to throw together a simple pasta sauce, to make stock, to slice an onion. And I can understand a month here, or a week there, where life gets in the way. But 3 months since I cooked regularly is unprecedented–except for the final 3 months of the PhD. Yesterday, Andreas finished the final read through, scanned it in and emailed it to his editor. I was out getting my hair done. We met up to go on to a friend’s birthday tea, and then we had a random fight in the car… because it suddenly dawned on Andreas that he had given away his baby. People often say finishing your PhD is like giving birth. I say, ‘no, actually, it’s like giving birth, then leaving your baby on the doorstep of a foundling hospital and walking away’. You hope the institution, and the examiners, will see it as your sweat and blood, your darling, and treat it kindly. But they might not, and there’s nothing you can do about it. And those emotions suddenly hit Andreas in a great wave. We took 15 minutes to drink our coffee (from the glorious Market Lane), and gather our composure, and went off to focus on someone else for 2 hours. On the way home, the air was thick with tension, and I cried. (In our relationship, the fact that I cried doesn’t necessarily mean I was sad, sometimes it means Andreas was sad. We’re entwined, as I said before). ‘That’s it,’ I said as we arrived home, ‘come here, sit down’ and we curled up on the sofa, a quilt over the two of us, and then the cat came and joined us. For the best part of an hour, I sat there with a sleeping author and a snoring cat. And then I did a load of washing and experimented with making my famous-on-three-continents spaghetti sauce in a pressure cooker. Today, we slept in. We drank coffee. Andreas went out and got the makings of mimosas and stock vegetables. We’ve been listening to music, drinking cocktails, he’s been reading one of my trashy books (‘it’s not trashy’, he interjects, ‘it’s very dark and suspenseful’). I’m about to make dinner. This is what our life looks like when it’s perfect. Finishing a book or a PhD means you’ll have ALL THE FEELS. That’s okay. You know the signals, trust them. The nightmares about eyes? The inability to cook? The disconnect from the garden? (Insert your own stuff here). Don’t submit just before someone else’s party (this includes family Christmas). Your submission party is not your standard party. (Double entendre only kind of intended). Last month I got to throw the ideal submission party–it was basically Finnegan’s Wake in standard English, and we were all wrecked for days after. Yesterday I threw the perfect book completion party for our house–it involved just the two of us, a nap, too much red wine, and spaghetti Bolognese. Have a second celebration, when you are recovered. In our house, that means mimosas, trashy books and barbecue chicken with basil aïoli. Again (insert your own stuff here). Oh, and DING DONG THE BOOK IS DEAD. LONG LIVE THE BOOK. This post was edited by Andreas, so it’s not heretical, incorrect or embarrassing. Wonderful post, you took me on the journey with you. And thank goodness it had a happy ending for the cat too.